The Drill Cracker works great as a black walnut cracker, English walnut cracker, Filbert nut cracker (Hazel nut cracker), macadamia nut cracker, almond nut cracker, and even on acorns, pistachios, and chestnuts! The Drill Cracker is getting rave reviews from around the world. Many have reported adding it to their roadside stands and farmers' market booths for added income! Where else can people get black walnuts cracked? The most popular use for the Drill Cracker is as a Black Walnut Cracker. Black Walnuts take a lot of dedication to crack. It has never been easier or faster using this automatic black walnut cracker. English walnuts are not that hard to crack. However, as an English walnut cracker, the Drill Cracker make quick work out of a large pile of English wlanuts without the need for a lot of hand peeling. Filbert nuts (or Hazel nuts) are becoming more American main stream. Used as a hazel nut cracker, expect for 90% whole nutmeat with a single pass. That translates into a 5 gallon bucket of cracker filbert nuts in less than 5 minutes! People are using this as a macadamia nut cracker. I had no idea what a macadamia was. Someone sent them in to test, now I am a macadamia nut! Almonds in Spain are very hard. Almonds in California are farily soft. Either way, expect 90% whole nut meat with the remaning 10% of the cracked almonds to be nice sized chuncks. There is very little almond nutmeat waste. The first surprise was when someone from Arizona reproted using the Drill Cracker as a pistachios nut cracker. Honestly, I had my doubts. But they reprot 85% whole nutmeat on the first pass. Is that good for a pistachio nut cracker? Those that use the Drill Cracker as a pistachio nut cracker are extremely pleased. The Drill Cracker is a high speed hard shell cracker. The cracking mechanism was designed for high speed industrial nut cracker facilities. It has been simplified for residential/ light commercial use. Simply attach a 3/8" or 1/2" variable speed drill to the Drill Cracker and start dumping hard shell nuts. This automatic hard shell nut cracker is designed to crack black walnuts, English walnuts, butternuts, macadamia nuts and hickory nuts. It can produce up to 90% whole nutmeat on Filbert Nuts (Hazel Nuts) on a single pass. 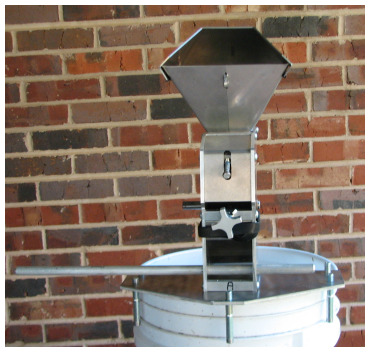 The Drill Cracker does not bog down in the least on the hardest black walnuts or Brazil nuts. 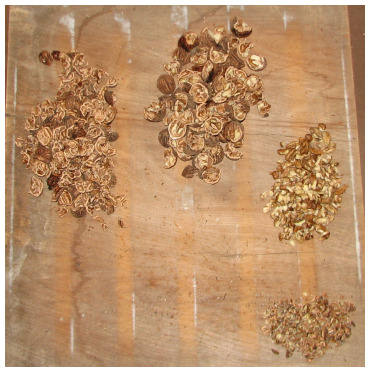 The pictures to the left show the Drill Cracker with the new hood that keeps black walnut fragments from spraying. It is very important to wear safety glasses when operating the Drill cracker. I know some of you may like to throw caution to the wind, but this is high speed machinery that is designed to fragment extremely hard shells and that means very sharp shrapnel! The view from the top shows a grate with an offset rotating block. The odd shaped block strikes the nut against the griping grate to cause variable pressure on the shell which fractures the shell. The turnscrew in the back controls the choke for the size nut. There is also a little lever that acts to lift the nut and clear the throat. Black Walnut Example: I ran a bread pan full of black walnuts for this demonstration. After the first run I sorted them. To the far left is the shells with no nutmeat at all. The top center are the cracked shells with nutmeat. 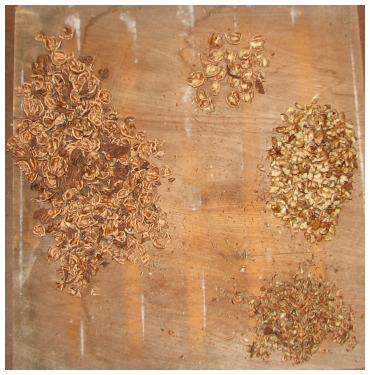 The right-middle is the easily salvageable pieces and the bottom right are small fragments of nutmeat and shell that I didn't care to sort. The picture shows how many large chunks of nutmeat are already available. With a little practice you should expect better results. 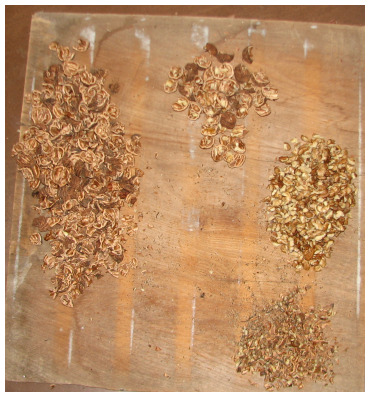 The 2nd picture shows a high percentage of empty shells and a growing amount of nutmeat. Once again, the nutmeat is very nice sizes. The third and final time I ran them left only a handful of shells with nutmeat. I could have ran it a fourth time or I could easily pick the remaining meat with little effort as the nutmeat is fully exposed. To fill up a 5 gallon bucket with the first pass should take less than 5 minutes. Sorting time depends on how many people and the level of motivation. The 2nd pass can easily be done in under 9 minutes with sorting being a lot easier as this is when the shells really surrender. The third pass can be done with maybe a rifling through and doing a quick re-pass on some remaining larger chunks in less than 5 minutes. The real danger at this point is the temptation to eat as much as sort! I know for this demonstration I had to keep telling myself to make this look as good as possible for those who are interested in actual results. My wife likes to sit in front of the TV and pick out the last bits so I don't run them a forth time. As I talk to people across the country and around the world, I find these results are better than they expect and on par with hand cracking, just a great deal faster and less work. I have been getting stories back that people are dehusking, taking off that green coating, with the Drill Cracker! Just open the choke up all the way and run it on low RPM. Be sure to thoroughly wash out the Drill Cracker after dehusking. Gunk can build up and affect performance. After de-husking, let the walnuts dry for 3 or 4 weeks before shelling. There are many people who are using this on a daily (seasonal) basis that are far more experienced and creative than me. My results with dehusking has not been favorable. If anyone can please give me some tips I will try and and get a video made. 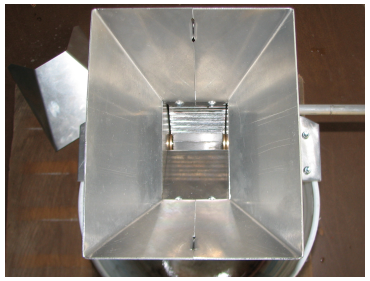 When we first started collaborating on a high-speed hard nut sheller cracker we didn't know it could be done at any price. The next step up for an automatic black walnut cracker is around $8,000! This is not a cheap device that will break easily. The Drill Cracker is designed and made in America for extremely long life. The material needed to make an electric black walnut cracker has to be food safe. These special hardened metals are expensive by themselves. Compounding the expense is it requires using heavy machinery at very slow speeds using carbide bits to exact tolerances. 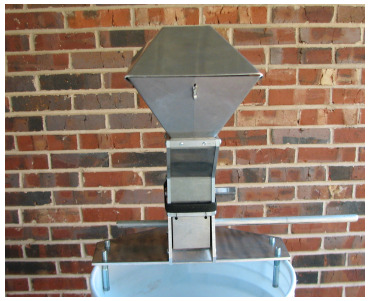 The Drill Cracker cannot be properly made using a garage mill machine.